Guest blogger Nancy Monson is a colleague and fellow member of the American Society of Journalists and Authors (ASJA). When she returned from a recent trip to Reykjavik, Iceland she recommended the destination as one that would be particularly appealing to travelers over-50 and graciously contributed this post. It’s January 2015 and I’m at JFK Airport in New York City waiting for an Icelandair flight to Reykjavik. Yes, Iceland! In addition, as a Scandinavian country founded by the Vikings and their Irish slaves, the country is part of my family’s heritage. That does NOT mean that my sister, Linda, and I found the Scandinavian palate favoring pickled herring to our liking. Luckily, there’s plenty of food variety to be had in Iceland, including (cue the disdain!) American chains such as Subway, and hearty breakfasts that typically come with a hotel room. Iceland did not disappoint—especially since we got a great Groupon deal with Gate1 Travel for $799 per person that included the round-trip airfare from JFK in New York, three nights’ hotel accommodation and breakfast, and one Northern Lights tour. The weather was nippy, but no colder or windier than the American Northeast in January. The one big difference: There were only six hours of daylight, lasting from about 10:30AM to 4:30PM. We only had to pay for the tour twice, though: all of the companies offer free repeat trips if you don’t see the lights on a given night. Which brings us to the surety of seeing the lights: While they are always present in the sky, they are not always visible on earth. And they display in a million different ways: Sometimes for a few minutes, other times for a few hours. Sometimes they’re green (the most common color), and other times they range to blue, purple, yellow, white and pink. Sometimes they are stagnant and hazy and other times they are active. I once saw the Northern Lights in Alaska (it was July, no less) and they were so active that it was like watching a movie for two hours! Blue Lagoon is an amazing steaming geothermal spring south of Reykjavik. The water is heated to 98 to 102 degrees F. We got into the lagoon inside the building, since the outside temperature was in the 30s. It was very amusing to see the lifeguards all bundled up in yellow vests, overcoats and boots while the guests were swimming in bathing suits! I had an in-water massage that was heavenly. They put me in a float and covered me with a wet towel and proceeded to massage my legs and head. Every few minutes, the massage therapist would dip the float to warm me up with new water. While I was receiving the massage, it began to snow lightly. It was the complete package! They also had a sauna and steam room at Blue Lagoon, a waterfall and silica mud bins from which you could scoop up some mud to apply to your face as a mask. One of the most well-known tours in Iceland is the Golden Circle featuring the Gullfoss waterfall, a geyser and the Mid-Atlantic Ridge—the place where the European and North American continents meet. 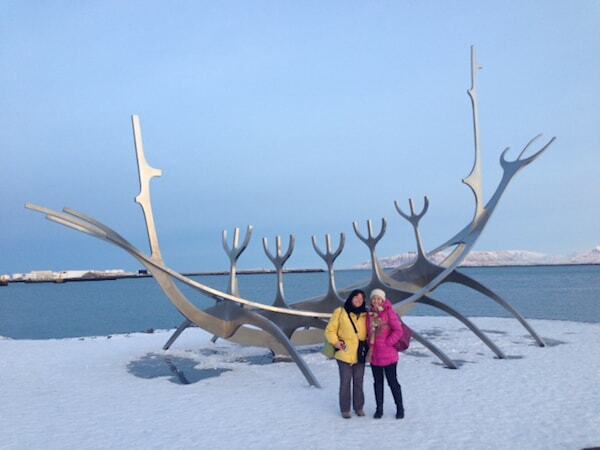 Linda and I did the Golden Circle on the third day of our trip with Gray Line Iceland. It was an amazing feeling to be so close to the earth’s core, crossing from the Eurasian tectonic plate through the Mid-Atlantic Ridge to the slightly higher North American plate. We then got out of the bus and walked along the North American plate. It was a beautiful, sunny afternoon and a lovely 20-minute walk looking over the Mid-Atlantic ridge, a valley of hardened lava. Icelanders are inordinately proud of the fact that they have been able to harness their country’s ample supply of geothermal water and steam to heat most homes and businesses. They are also proud of the fact that they’ve run plastic piping under the streets and sidewalks of Reykjavik to melt snow so they don’t have to shovel or plow. Unfortunately, this tactic doesn’t really work that well, as there was ice everywhere, making walking treacherous. The Icelanders—friendly, sturdy, practical types—seemed oblivious to the dangers. Perhaps someone should tell them?! *This is the volcano that erupted in 2010, blowing ash all over the place and disrupting air travel throughout Europe. And no, I can’t say it either! Nancy Monson is a content provider and editor, health coach and artist. Her work has been published in numerous major national magazines such as AARP The Magazine, Family Circle, Glamour, More, Redbook, Shape, Woman’s Day and Women’s Health, as well as on websites and blogs. She is also the author of Craft to Heal: Soothing Your Soul with Sewing, Painting, and Other Pastimes, about the therapeutic benefits of pursuing a creative hobby. A version of this article was previously published on her blog, Creative Wellness with Nancy Monson. I’ve been hearing about more and more people going to Iceland. I think the exchange rate has vastly improved for those with US dollars. Usually, I would cringe at the thought of flying to Europe for less than a week, but Iceland is a lot closer to the east coast of the US. (Our October flights to and from South Africa changed my thinking about what constitutes a long flight). The northern lights are also high up on my bucket list and Iceland is a lot closer to Philadelphia than northern Finland—-or even Alaska. The flight over from JFK was about 5 1/2 hours. Back, it was about 7, since we didn’t have the tailwinds. I found that four days was plenty in winter given the lack of light. We were going all the time, too, and out late every night searching for the Northern Lights. As for cost, it didn’t seem inordinately expensive. We didn’t eat at any fancy restaurants, though, and because we had the Groupon, it was very reasonable. Iceland is great for the 50 and over traveler because there are gravel paths to the major nature sites. Though I like winter, I would go in the summer months when the weather is in the 50s and 60s and there’s not a worry about walking on ice. I was there in September, 2014, for a conference in Reykjavik, and took a 5 day trip to the Northeast and a 4 day trip to the South before and after. Some travelers take the Ring Road around the edge of the country: 1200 miles, but even seasoned travelers sometimes have trouble finding their way to places when they get off. I think it’s better to book short trips to a specific area with a tour company (many on the web). Lots of travelers go only to Reykjavik, a colorful little city with great restaurants, and the Blue Lagoon, but thee are many pools like that all over the country, and they are not so huge. Nature is the culture here, and it is fascinating: old herring towns on the coast, waterfalls five times wider than Niagara Falls, geysers, and delicious food. Cutting edge art too. Yes, I hear the art is quite good. We didn’t make it to any museums due to time constraints, but I would have liked to have seen their artwork. Next time–in the spring or summer. The ice was definitely a concern. I twisted my ankle the first day I was there! Luckily, I recovered fairly quickly, but many areas were scary–like the path to the geyser on the Golden Circle. Totally covered with ice! Blue Lagoon was amazing…check out their website at http://www.bluelagoon.com. And yes, the Northern Lights can be elusive, but the tour companies don’t tell you that! wow – a trip of a lifetime! Love the photos; such beauty everywhere. Nancy I had no clue so many films were shot in Iceland. As for the Lights I’d visit during peak winter months just to see it; and hey, in Jan., in NYC, you’re well accustomed to Icelandic, Arctic chills lol 😉 I just flew out of JFK to Bali on Feb 3, knowing full well how cold things have been. Thanks, Ryan. I believe it was and is actually colder here in NY/CT than in Iceland!